For the following story we thank Keith Wileman from the Portsmouth Cyclists’ Touring Club. 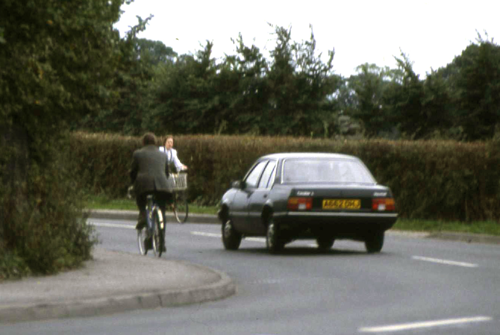 One evening in 1984 a group of local cyclists met in a house on Hayling Island to discuss what could be done to make cycling safer in the Havant area. 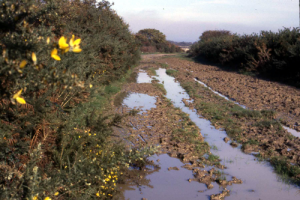 We felt we needed one particular objective to focus on and, possibly because several of the people at the meeting were Hayling residents, we decided that objective would be to provide a safer north-south route on the island by using the disused railway line. We called ourselves the Havant and District Safe Cycling Campaign (a bit of a mouthful and it came to be referred to as the Havant Cycling Campaign) and formed a small committee. We lobbied Havant and Hampshire councillors and council officers; we gave articles to the Portsmouth News; and we held a public meeting at the Ship which was attended by a number of Havant councillors. 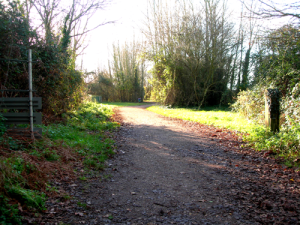 Most important, we contacted John Grimshaw of the Railway Path Project in Bristol. John Grimshaw, a civil engineer, founded Sustrans and was their Chief Executive Officer until 2008. We organised a second public meeting (I think it was November 1984) at the Ship and on the morning of the meeting John came by train from Bristol with his Moulton. After a brief discussion he rode down the length of the railway line. Over tea we discussed John’s ideas in more detail and he put together a presentation using some slides which had been taken a few weeks before. He gave this presentation at the evening’s meeting. An impressive presentation, especially as it was all prepared in half a day. More lobbying; more feeds to the News; presentations to various groups, including the Bosmere Hundred Society; around May 1985 a display in Havant precinct which included a boneshaker and a penny farthing to attract people’s attention We organised a circular ride from West Town to Havant (to near the museum) and back, one way along the track that was the old railway line, and the return along the main road. One of Hayling’s lady councillors got involved, surveying and comparing the routes from the back seat of a tandem that was piloted by one of our members. She became a useful supporter. In April 1985 John Grimshaw produced a detailed proposal for the cycle path which we distributed to the relevant influential people. A minor distraction occurred when another local group also became interested in the disused railway line with a view to restoring the railway and rebuilding the bridge. There was a lot of letter-writing to the local press from both sides, with arguments against the cycle route including how little cyclists spend compared with other tourists – “They ride to the beach and take sandwiches in their saddle bags”. The railway enthusiasts arranged a public meeting at the Hayling Billy pub, but a lot of support dropped away when it was pointed out that the island’s gas main had been laid under what had previously been the railway line. The councils didn’t take their suggestions too seriously and continued their support of the cycle path proposal. Two of us were invited to meet the HBC chief executive who congratulated us on the quality of the proposal. 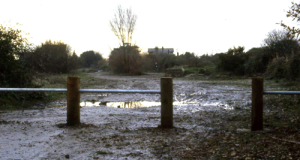 Of course there were a lot of planning and legal matters to sort out, but eventually work started on the Hayling Billy trail. Not that it was perfect, far from it. I believe the Portsmouth harbour authorities refused to allow a tarmac path on the grounds of detraction from the natural environment, so the limestone dust surface was not the best for good quality machines and suffered in bad weather; a fence (wooden posts with two strands of wire) divided the cycle path from the path for horses, this was often cut (fishermen wanted to get to the bank or perhaps horse riders wanted to use the cycle path) or the posts were uprooted. One of our number was given a post-driver and some wire by the council so that he could do some repairs. He used to leave for work early with a few lengths of wire in his saddlebag to do running repairs. The trail has been extended, improvements have been made and the path is now well used. But what of the Havant Cycling Campaign? We were all cyclists so we started to publish a list of monthly Saturday rides and evening rides. These became very popular – mainly due to the statement on our rides list: 50 miles, leisurely pace, nobody left behind – and more frequent and those not working started to ride on Wednesdays as well. We started to have monthly meetings at the United Reformed church in Havant with slide shows, presentations and speakers on a wide variety of topics (not just cycling) which attracted non-cyclists and helped our name to get about. The group branched into foreign travel and somebody stuck an inspired pin into a list of Normandy hotels and hit upon perhaps the only hotel in Normandy where the owner used to race with Jacques Anquetil. For several years 30 or so of us spent the May bank holiday weekend in Montebourg. 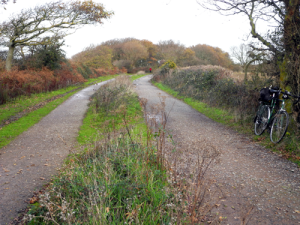 And what of the Hayling Billy Trail? Well used, well known, well signposted but, as at December 2014, with a far from ideal surface. When I took photos to compare them with the 1984 photos I had to find stretches which were not covered in large puddles and I had to wash my bike when I got home.